For full disclosure I received this sample bottle from Van Gogh Imports. Tap 357 is a Canadian Rye Whisky crafted from cask-aged 3, 5, and 7 year old rye whiskies blended with pure Canadian maple syrup. It is distilled four times before being aged in used bourbon barrels. It is then combined with “Canada 1 Light” maple syrup and left to rest until it is deemed that it is ready for release. Finally it is bottled at 81 proof. Tap 357 pours a light golden straw color. On the nose it evokes memories of Sunday morning breakfast with pancakes, smothered in butter and syrup. There are notes of maple and grain, with the maple being dominante. 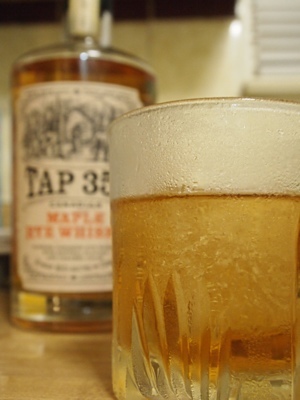 The sweet maple flavor helps to mellow the spiciness of the rye, without overpowering it. There are notes of maple, brown sugar, and just a hint of grain. Overall its a nice product, that is smooth and approachable. Some may find the sweetness of the maple overwhelming especially when drunk neat, but I do think that it works well in cocktails. Tap 357 has a suggested retail price of $29.99 for a standard 750ml bottle. The apple brandy and the sweet maple rye work well together creating a drink that evokes the aroma of baked apples. The bitters help to keep the drink from becoming overly sweet and unbalanced. Sounds awesome! Somehow, I never want to put orange bitters in apple-flavored drinks. There’s nothing wrong with it, but it feels like comparing apples and oranges. I bought a bottle of this on a whim at my neighborhood liquor store in Knoxville, Tennessee. I’ve been experimenting with more rye whiskeys and the maple syrup addition seemed intriguing. I was afraid it would be too sweet, but it isn’t overpowering at all. It makes a fantastic Old Fashioned. I’ve packed my bottle with me to enjoy on vacation this week and found your site while searching for additional recipes to try. Thanks for the inspiration on the apple brandy idea.